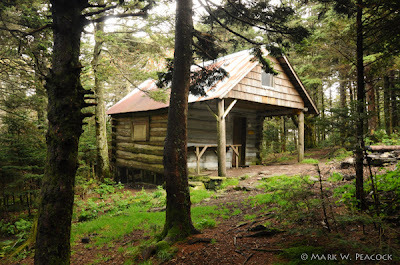 The last time I went to the Roan High Knob Shelter the snow was several inches deep (see photos and my short write-up of the history of the shelter here), so I thought I'd venture back to see what it looked like in the summer. To be honest, it looked a lot better covered with snow! The old fire warden's cabin is in pretty rough shape, but not bad considering it was originally built back in 1933 (renovated in 1980). Below is a handheld panorama of five photos stitched together in Photoshop of the steep and winding side trail leading off the Appalachian Trail to the shelter (click to enlarge). 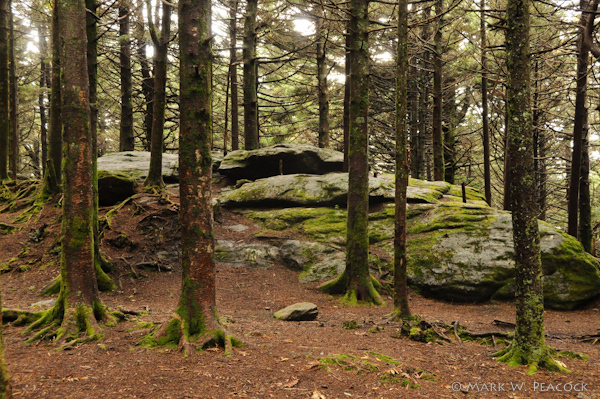 While I was there I noticed that there's a very nice spruce forest behind the shelter, and as I explored that I came across the 1934 survey marker (on the top of the boulders you see below) marking the highest point on Roan Mountain at 6,285 feet. Directions: Take Route 19E to the town of Roan Mountain, turn onto Route 143 and travel 12.8 miles to the TN/NC state line (Carver's Gap). On your way up the mountain, you'll pass through the Roan Mountain State Park. Eventually, you leave the state park and enter the national forest. 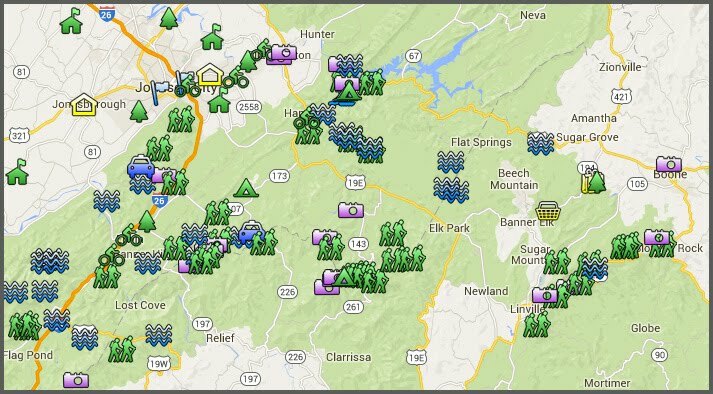 Option 1: Park at Carver's Gap and take the AT approx. 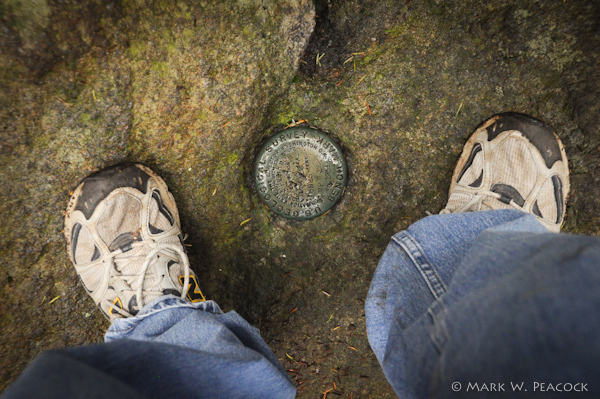 1.5 miles up (heading south on the AT, away from the Balds). I really like this section of the AT. It's beautiful and, while a steady climb, not as steep as you might think. -- Option 2: Turn right at Carver's Gap and continue driving up the mountain to the Old Cloudland Hotel Site (this road is closed during the winter months). Pay the entrance fee ($3) and park at the end of the lot nearest the bathrooms, look for and climb a short flight of stairs and venture to your left. You'll soon run into the AT. Turn right to hike north on the AT (toward the balds) for a short distance (approx. 1/2 mile) -- on the way you'll pass by an old chimney. The shelter is located one tenth of a mile off the AT on well-marked, blue-blazed trail. Click here for the Google map of the Roan Mountain area. 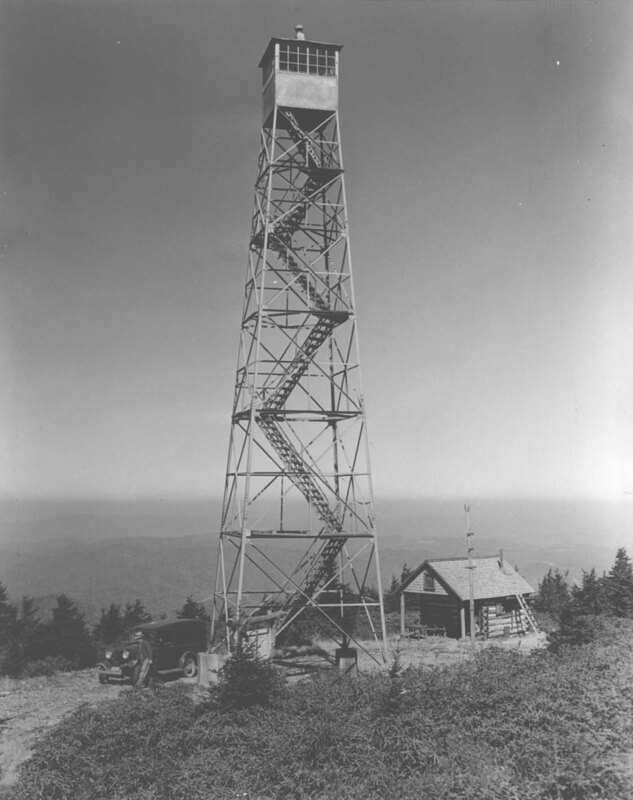 In winter months, when the road to the top is closed, I hike a loop -- taking the AT up to the Cloudland site and then walking the road back down to Carvers Gap. Mark ... I'm glad I'm not the only one who thinks this shelter is, well, less than photogenic!! Last time I was there was in early August of this year, and the whole area was FILLED with those horrible cluster flies! Those flies were an inch thick along the shelter's vertical posts, and where swarming around everywhere!! YUCK! The rock formation however, is always one of my favorite spots to head to, and I usually plan to have lunch on top of them! Nice panorama of the trail intersection!